The Lammertal is a river valley in Salzburg, Austria. More specifically, it can be found in the south of the Tennengau region, about 40 kilometres south of the city of Salzburg. It is one of the state′s official tourist destinations as outlined in our article on Salzburg Province and named after the Lammer River, which runs though it. The main town in the Lammertal is Abtenau, from where you can access three smaller communities: Annaberg-Lungötz, Scheffau am Tennengebirge, and St. Martin am Tennengebirge. For tourists, the Lammertal has bi-seasonal offerings in both winter and summer. During the summer season, it attracts hikers, mountain bikers and other friends of Alpine mountain sports. According to their own accounts, the Lammertal has some 300 designated hiking routes and 270 kilometres of cycling paths. During the winter season, skiing is obviously the big deal about the are. That being said, note that the Lammertal is primarily presented as a skiing destination appealing to families with children. The slopes are less demanding than those further south and the party scene is not developed sufficiently enough to draw young, international skiers. In terms of skiing areas or ski lift associations, the Lammertal has parts of the skiing regions Lammertal Dachstein-West, Abtenau and Postalm. All three of them are popular among families and have a selection of hotels and ski lifts. Geographically, the Lammertal is a side-valley of the Salzach River valley, the main lifeline of the state. 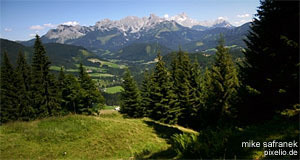 It is framed by the mountain ranges of the Dachstein massif, the Tennengebirge and the Bischofsmütze. The Tennengebirge is where you can find the source of the Lammer. The river course is 41 kilometres long, the Lammer merges with the Salzach near Golling. Within the Lammertal, rafting and other water sports have become very popular in the region. This is partly due to the relative vicinity to Salzburg, at least as far as domestic tourists are involved. Note that there is also a relatively famous gorge, the Lammeröfen near Oberscheffau (at the community of Scheffau).